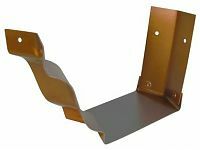 Copper Penny Bay Strip Miters are the same as strip miters but work on corners that are 45 degrees. Adjoining gutters need to be cut at 22.5 degrees each. Great for bay windows.